Sunshine is an industrial and residential suburb 12 km north-west of central Melbourne, situated at the junction of the railway lines to Ballarat (1889) and Bendigo (1862). At Ballarat the McKay Harvesting Machinery Company was successfully selling H.V. McKay’s combined stripper-harvester to wheat farmers in Australia and overseas. The Ballarat location, however, incurred uncompetitive transport costs for fuel and components and the company moved its Sunshine Harvester Works to a seaboard location by purchasing the Braybrook Implement Works. McKay resisted control by industrial arbitration (resulting in the Harvester judgment, 1908) but promoted the provision of housing and facilities for his workers. 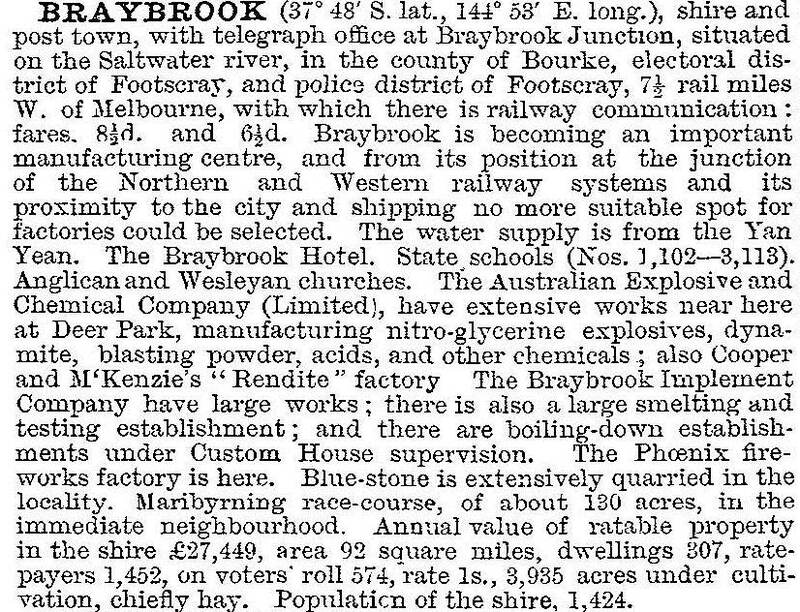 The rapid growth of the company dominated Braybrook Junction and in 1907 it was named Sunshine. The site of the McKay Harvester works was north and west of the Hampshire Road shopping area. Taken over by Massey Ferguson (Australia) Limited in 1955, the works were later closed and became the site of the Market Towers Shopping Centre in 1997. A number of other industries followed McKay to Sunshine: a pottery (1916), Nettlefolds screws and fasteners (1924), Sunshine kitchen cabinet works (1919), Wunderlich cement sheeting and terracotta (1925), and Spalding sports goods (1925). A primary school had been opened at Braybrook Junction in 1891, and in 1913 the Sunshine technical school was built on land donated by McKay. Half of the students were apprentices from the harvester works. In 1937 it became coeducational. During the 1920s substantial numbers of British and Maltese migrants settled in Sunshine, and housing was sponsored by the War Service Homes Commission and the State Savings Bank. Houses were mostly built on medium to large allotments in double fronted or bungalow style. The shopping area near the railway station, friendly societies, sporting clubs and churches grew, and the shire hall was moved from Deer Park to Sunshine. The Sunshine advocate, the area’s first local newspaper, began in 1924. At the onset of the Depression the original primary school was replaced by a new two storey brick building (1931). Increased factory and house building began in about 1948. Sunshine became a residential area for factories further afield, such as I.C.I. in Deer Park (over 2000 employees) and meat works and Monsanto Chemicals in Brooklyn. Housing was built by cooperatives, the Housing Commission and building societies, and prefabricated units came with British migrants under the ‘Operation Snail’ (that is, carry your own house) scheme. In 1951 the municipality added 1200 houses to its stock of about 5000. Sunshine East primary school (near Braybrook) opened in 1951, Sunshine North primary school in 1955 and the high school in 1955. 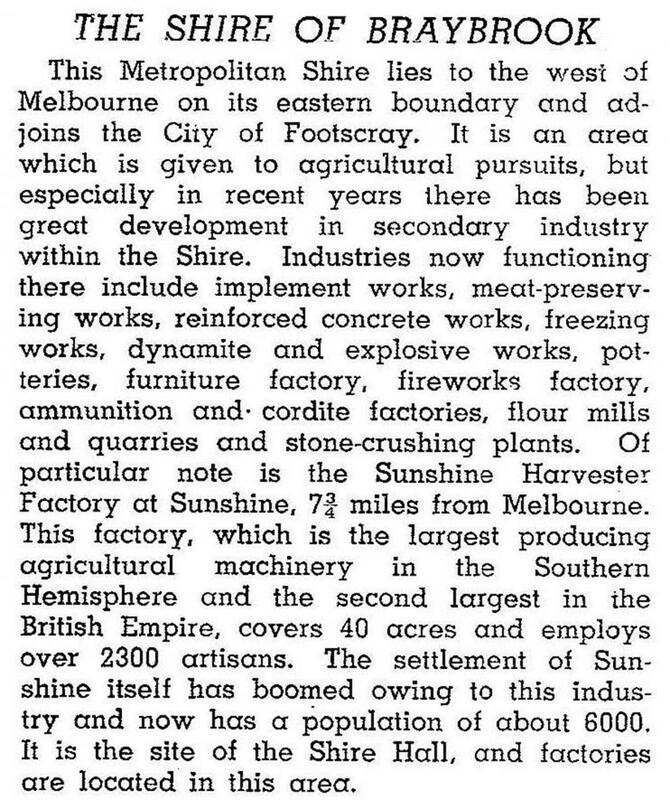 On 16 May 1951 Braybrook shire (see Braybrook entry) became Sunshine City. Since 1922 the shire hall and offices had been in Sunshine. *North of Ballarat Road **West of Kororoit Creek to Western Ring Road. Absorbed part of Ardeer, south of railway, 1998, which has State primary school (c1974) and high school (c1976) now a campus of Sunshine College. Sunshine North and Sunshine West are described in separate entries. Sunshine has a large shopping area around the railway station, with growth northwards as it increasingly fulfils a regional role. There are three public reserves near the town centre, and two others north of the Western Highway, both near the former high school. The large family entertainment centre and the Melbourne Westend Market are on the border between Sunshine and Albion. South of the town centre there are two public reserves, of which O’Brien Park beside the railway is one of six remnant Western (Basalt) Plains grasslands in the region. The H.V. McKay heritage offices can be found in Devonshire Road and Anderson Road, where there are the heritage listed offices and memorial gardens, and a memorial Presbyterian church (1926) of traditional English design. The median house price in Sunshine in 1987 was 73% of the metropolitan median, and in 1996 it was 63%. The relative fall in prices was common in communities affected by the decline in the manufacturing sector. On 15 December 1994, most of Sunshine city and most of Keilor city were united to become Brimbank city. The part of Sunshine city east of Duke Street (that is, Braybrook, Maidstone and Maribyrnong) united with Footscray city to become Maribyrnong city. The Wunderlich factory manufactured asbestos sheeting for 50 years up until the early 1980s and was owned by both CSR and James Hardie before it closed leading to a rise in reported local mesothelioma cases. Sunshine was identifed in 2013 as the key growth centre in Melbourne's west, with the new metropolitan planning strategy to encourage government and private-sector investment in the former industrial heartland. The proposed development of the new regional rail service through Sunshine (including new stations, through tracks and dedicated platforms at Southern Cross) boosted the area's already strong public transport links and aided the development of new research and employment precincts. A new plan to revitalise the Sunshine Town Centre called 'Sunshine Rising' was developed for implementation 2012-17. Earlier populations are listed under Braybrook.